Don't Eat the Paste: International Can-It Forward Day 2016!!!! It's that time of the year again! When our gardens and the U-Pick-Its are starting to really produce. When it's time to start canning! When Ball® brand has there International Can-It Forward Event with lots of opportunities to learn and win Ball® products! I canned as a kid with my mom, and when I was invited to be a part of International Can-It-Forward, used the opportunity to teach my daughter to can. Since then, we have not bought any jams or jellies. That's one way I canned it forward- by learning from my mother and teaching my daughter. This year, my garden had enough excess from my perennials that I was able to give plants to my friends to grow their own berries and rhubarb. That's another way to Can-It Forward- by sharing plants that you know are good producers with friends who like to can. 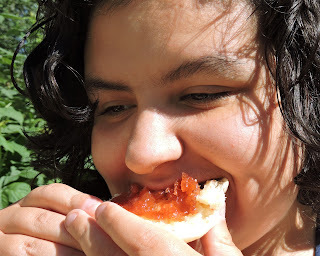 My daughter and I can a lot of jams and jellies and give them to friends and local charities. That's another way to Can-It Forward. Friends from hotter states see my raspberries and get excited knowing they will get some of the amazing jam made from it. You can also teach people to can, give them a basic supply kit to start in small scale canning. That's another great way to Can-It Forward. You can take the pledge here to learn about canning and share the love of canning and learn what Ball® brand is doing for charities in the spirit of Can-It Forward. You will also get a 5.00 off coupon for the Fresh Preserving Store for taking the pledge! This year, the fine people at Ball® brand sent me their new cookbook, The All New Book of Canning and Preserving, a case of those gorgeous blue wide mouth jars you see in the background of this photo and a $5.00 off coupon for the Fresh Preserving Store and will give the same thing to one of my lucky readers in the U.S.A.!! Leave a comment to enter and we will pick a name at random to win on the 24th! Shipping will be directly from the prize supplier, and I'll need a way to contact the winner to get the information- email, FB page or Twitter account. So the book? We went through the recipes and there are a lot we are planning to try. My son is particularly enthused about the Fiery Fermented Hot Sauce recipe that uses habanero peppers. I like the idea of making my own Worcestershire sauce because we use it a lot. But it's the jellies and jams that we always look at first. 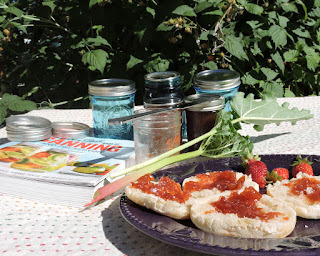 We made the Strawberry-Rhubarb jam on page 30. There are soup recipes, instructions for making kombucha and other fermented goodness, sauces, seasoning mixes and all sorts of other yumminess that makes fantastic gifts or ways to save money and provide good food for your family and friends. Just as an aside, a couple weeks I commented on a photo on Ball Canning on Facebook that I can never grow enough strawberries to can my own. A lot of people liked the comment so apparently I'm not the only one! We bought strawberries, but rhubarb, that amazing plant, we have plenty of that. So we chose between this and a rhubarb-orange marmalade. The jam is fantastic!! 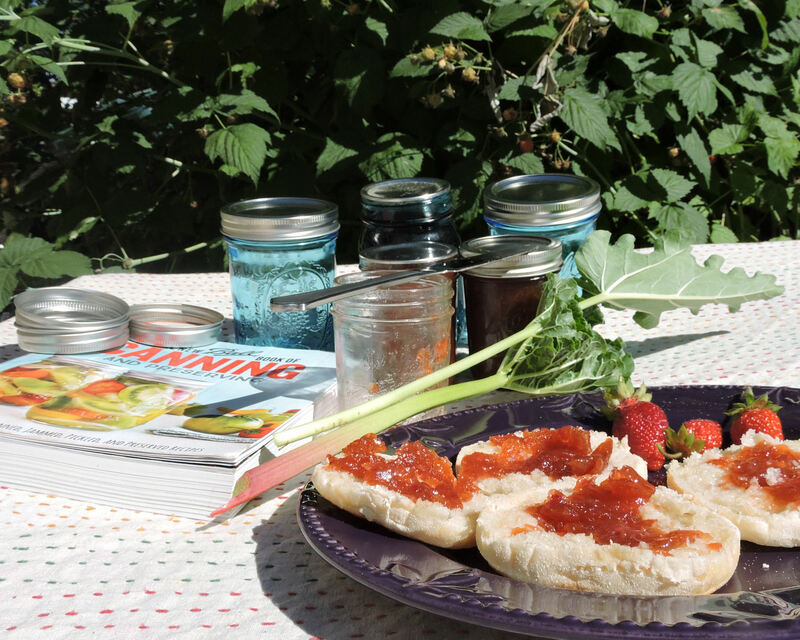 If you like Strawberry-rhubarb pie, you'll love this jam. It's like having dessert for breakfast. 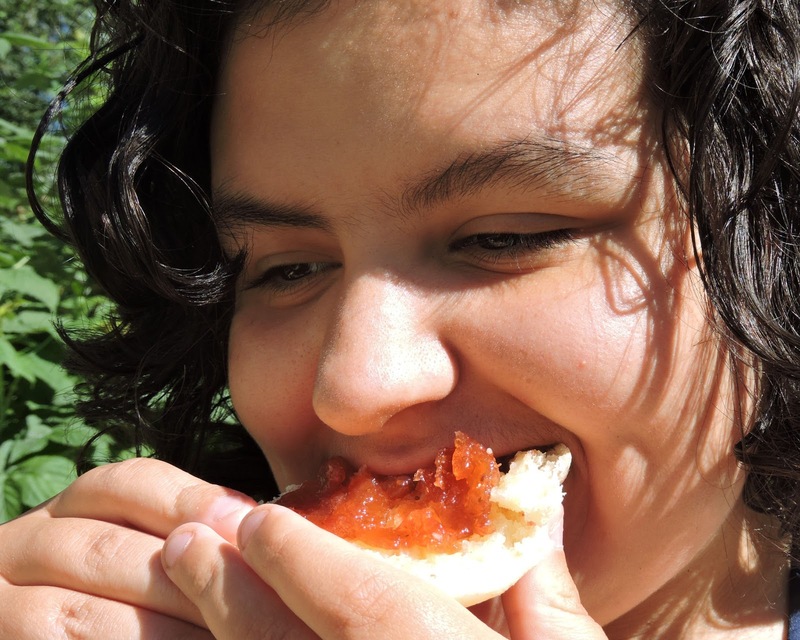 As soon as the photo above was taken, my daughter grabbed the English muffin. I think her face says it all. The book is full of great recipes that are clearly written with the steps written out very well for beginners. Like any of the Ball® publications, it has photo step by steps for canning methods. If your a more visual learner, be sure to tune in on the Ball Canning Facebook page on Friday July 22nd for videos from 10:00AM – 3:30PM ET. Each hour, viewers will have the chance to win a giveaway prize! You can also post things on Pinterest and Instagram using #canitforward and check out their Pinterest page here- Ball® Canning on Pinterest, BallCanning on Instagram. Ooh.. I just opened this book at random and found a recipe for Summer Bounty Zucchini Relish that looks fantastic. I need to check my garden and see how my zucchini is doing. I'm a novice canner, and still have so much to learn. I did can several jams and jellies, last year and gave them as gifts to friends, and family. But, I want to learn and do more, and a bigger variety!